The power supply has a port to connect to an AC power cord. 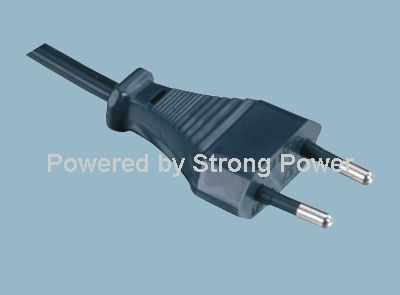 For example, some power supplies include apertures configured to engage prongs of a plug portion of an ACpower cord or a standard electrical cord. The cabinet housing the server may include a cable management arm that is configured to receive and retain the AC power cord that is attached to the powersupply so that the AC power cord does not dangle loosely where it could interfere with the operation or storage of other servers or similar devices within the cabinet. The cable management arm is configured to slide along rail racks within the cabinetand to extend and fold in an accordion style. When an AC power cord is connected to a power supply and the power supply is connected to a server and the server is inserted into the cabinet, the cable management arm is pushed back by the advancing server and folds into a folded or retractedstate. When the server is removed from the cabinet, the power supply pulls on the plug of the AC power cord which, in turn, pulls on the cable management arm thereby unfolding and extending it. Several embodiments of a securing device for retaining a power cord in a connected relationship with a power supply are disclosed herein. In a first embodiment, the securing device comprises a substantially planar body having a first end and asecond end. The first end is configured to engage the power supply and the second end is configured to engage the power cord. The body comprises a substantially rigid material. In this first embodiment, the securing device does not provide anelectrical connection between the power cord and the power supply. In a variation of this implementation, the second hook is configured to provide a snap-fit connection to the power cord. In another variation of thisimplementation, the first end also comprises a hook. In still another variation of this implementation, the second hook comprises a curved member configured to form a central aperture. The central aperture is configured to receive the power cord. Thecentral aperture is dimensioned to obstruct a plug that is attached at an end of the power cord from passing through the central aperture. 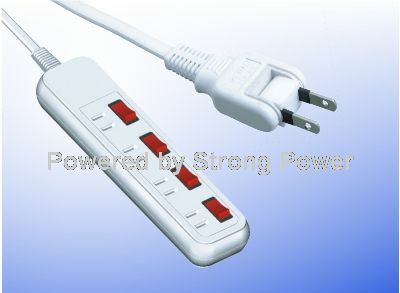 In a further variation, the body may be configured such that the second hook is disposed adjacent the plug whenthe body is connected to both the power cord and the power supply. The pair of first hooks may be spaced apart from one another along the first end. In a further variation, the second end comprises a pair ofsecond hooks. The pair of second hooks are spaced apart from one another along the second end. In a further variation, the pair of first hooks are substantially coplanar with the pair of second hooks. In a further variation, the pair of first hooksare substantially transverse to the pair of second hooks. The pair of first hooks are configured to engage a handle that is attached to the power supply. The second end has a pair ofintegral second hooks. Each second hook is spaced apart from one another along the second end. The pair of second hooks are configured to engage the power cord. One of the second hooks has a central aperture that is dimensioned to obstruct a plugattached at an end of the power cord from passing through the central aperture. The body defines a first aperture extending therethrough. The first aperture is disposed proximate the first end. The body further defines a second aperture extendingtherethrough.